My family decorated our home for Christmas the other night, and my eldest daughter was puzzled when I handed her our Mistletoe holder. The vikings used to tell stories about their gods and heroes. The most popular god of all time was Baldur. When Baldur began having troubling dreams about his mortality, his mother went to every living creature and asked them to never hurt her son. All of creation loved Baldur and agreed at once. But Baldur’s mom forgot to ask the mistletoe. 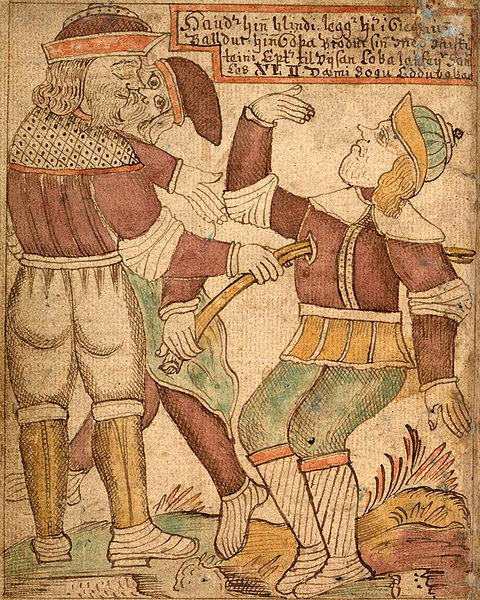 The Death of Baldur from an Icelandic 18th century manuscript. Being (nearly) invincible, it became a fun sport to lob axes, knives, and arrows at Baldur. He would laugh off each blow as none of it hurt him in the least. In time, Baldur’s only real enemy, Loki, discovered his weakness. And so he crafted an arrow made of mistletoe and tricked Baldur’s blind brother Hodur into shooting at Baldur. The arrow killed the hero and mistletoe became a reminder to show love while we are alive, because no one lives forever. There’s a lot more to the story about how the gods petitioned the keeper of Helheim (the world of the dead) to return Baldur to life and how Loki thwarted that plan too, but the part about the mistletoe ends there. So what does this have to do with Christmas and kissing? I like to think that the mistletoe tradition was rolled into Christmas celebrations because of the similarity of their intent. Christmas, like the message of the Baldur’s mistletoe story, is a time to celebrate life. 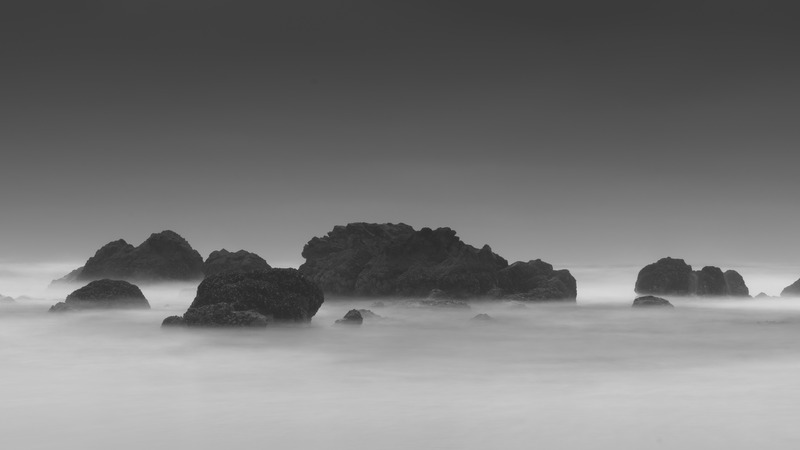 Christians are specifically celebrating the gift of Christ whose death brought life everlasting, but as this gift can only be accepted by the living, the same sense of urgency and awareness of mortality exists within both narratives. I hope this new knowledge helps you appreciate the mistletoe a little more this year. Now get out there and greet each other with holy kisses! Fresh off my reading high of Myths of the Norsemen by Roger Lancelyn Green, I was eager to dive into Loki’s Wolves, a middle grade adventure in the vein of Percy Jackson, but informed by the Norse mythology of which I am so fond. Norse eschatology (the study of the end times) consists of the final battle between the Aesir (Odin, Thor, and family) and the evil race of Giants (aided by Loki and his children) called Ragnarök. Unlike most other religions, the gods of the north are killed in the battle. 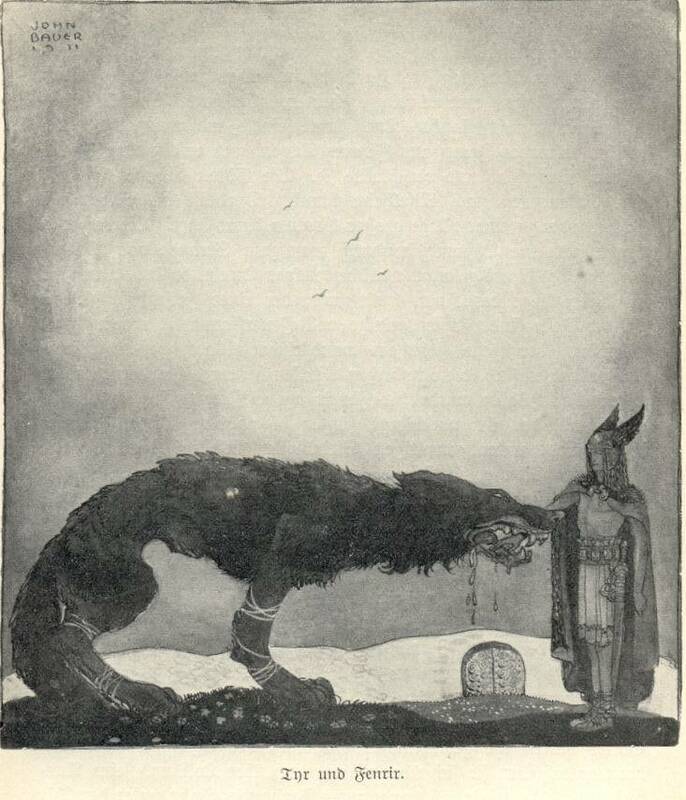 In Loki’s Wolves, the gods of north are already long dead, but their descendents still walk the earth and must assume their role at Ragnarök. When thirteen-year-old Matt Thorsen first discovers that he is the human embodiment of Thor, he is happy if a bit overwhelmed. But when he remembers that Thor must die in the final battle–and that his grandfather is supportive of his death–he embarks on a plan to change the legend. Is it possible to stop the Fimbulwinter and the end of all life without making the ultimate sacrifice himself? The problem is that in order to change his destiny, Matt must rally the other human heirs of the gods to his cause, and the children of Loki can be a bit wolfish at times. Loki’s Wolves by K. L. Armstrong & M. A. Marr is a quick read that focuses on the tension between family expectations and the bonds of friendship. It was a refreshing twist on Norse mythology that teaches as well as it entertains. I thoroughly enjoyed it and would recommend it to fans of the other “gods-re-imagined-as-teenagers” books that are out there. Parents should know that by its nature, threads of violence run throughout this book. All the same, I don’t feel that violence was glorified as the solution to problems. Rather, even the representative of Thor–a god who never had qualms with using his hammer to start or end a fight–seeks alternatives to violence when they are available. The story continues in the next installment of The Blackwell Pages, Odin’s Ravens, which is also available now (and is next on my reading list).